Natural Weight Loss? Drink Your Basil Seed Tea? I had a bumper crop of sweet basil this summer and have been staring at a bowl of the dried herb for over a month. The reason I left it sitting there was because I thought the seeds might be bitter and didn’t know if I should separate them from the leaf before I stored it for my spice cabinet. Today I finally got around to doing a bit of research about the seeds and I see more than one source recommends basil seeds for weight loss. Are you kidding me? And I was going to throw them out? Could it be that simple? I doubt it but you can be sure I’ll save them and see if I enjoy the Thai style of basil seed tea that’s so popular within that culture. For years I drank a hot cup of cocoa every day but lately I thought the caffeine was bothering me so I laid off of it for a couple of months. I had some yesterday and what an elevated feeling I received for hours afterwards. What a fool I’ve been. Anyway, chocolate is back in my life and because I try to limit sweets these days, especially sugar, I use a teaspoon unsweetened powdered baking cocoa to a cup of hot water and it’s quite pleasant. Now mind you, I’m not afraid to indulge in some real chocolate candy and I’ve found that even the inexpensive chocolate bars are quite delicious. In my home we’ve learned to love curry, a mixture of spices, one of which is turmeric. I developed a taste for curry in London. As a vegetarian it was difficult to find meals but the Indian restaurants always came through. When you’re far away from home and you walk into a restaurant and order warm golden-colored curry, it leaves an impression. To me, curry means anything with curry spice in it. It can be rice and vegetables with curry or a soupy curry with legumes. I think of it as “comfort food”, especially when I hear statistics showing Indians who eat curry regularly show fewer signs of Alzheimers. And curry is a good way to use what’s in the fridge needing to be eaten. Sometimes I make curry with lentils and sometimes it’s black-eyed peas. Every pot of curry is different. Today’s curry started with a base of dried split peas. After they were cooked at a low temperature I added carrots, celery and zucchini and simmered. I threw in a handful of uncooked brown rice and added a teaspoon of curry powder and left it for hours on the back burner just below the simmering point. Soy sauce will flavor each bowl. It takes practice but a cast iron skillet is a fabulous way to cook without oil. You can add a tiny bit of water or broth to the skillet. For example, frozen corn and onions on the skillet with a tiny bit of water – cover and simmer a few minutes Before all the water gets cooked out, crack a couple of eggs on top, piercing the yokes. After a brief heating from the stovetop, stick the skillet in the oven and “broil” to cook the top. After removing from the oven, use a firm metal spatula to lift it out. The trick is to not let the food stick to the skillet, which it shouldn’t if you don’t let it get dry. Add some fat-free salsa and voila, a delicious omelet! If You Don’t Feel Good, Eat Beans! No Kidding! My husband laughed when I said this to him but my bean and legume soups help him to cut firewood, build barns, repair cars and ride motorcycles in the cold. A big bowl of split pea soup will provide 11 grams of protein; eight percent of one’s daily Vitamin A, fifteen percent daily iron requirements and drum roll here… forty-four percent of daily fiber. Black beans provide nine grams of protein per serving and a whopping sixty-percent of daily fiber needs. Lentils provide eight grams of protein per serving and thirty-six percent daily fiber needs. AND there is absolutely NO fat or cholesterol in them, ZERO. If you need to go fat free, you can make delicious dishes with beans and legumes without adding any extra fat. If you don’t believe me, just ask my husband when he gets finished hefting that hay. 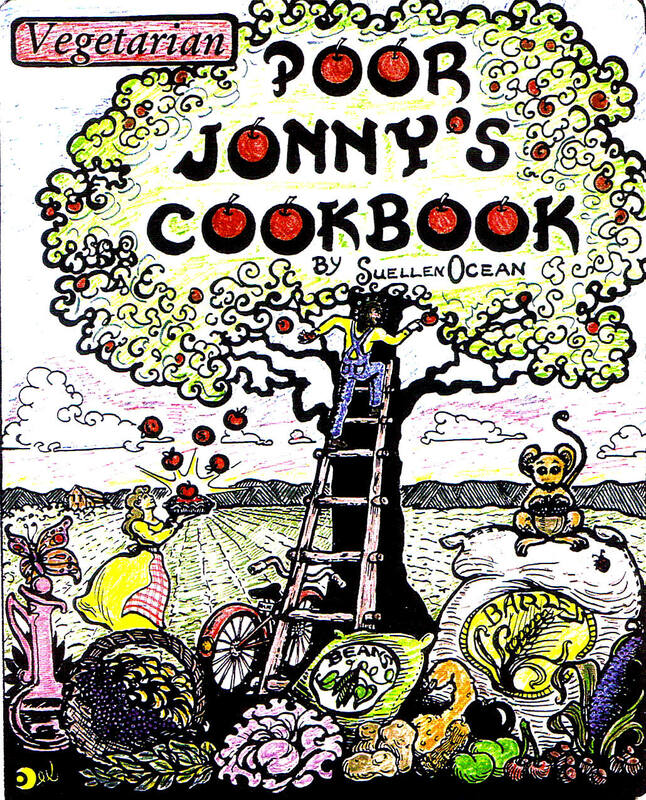 A cookbook for poor people, rich people, starving artists, students, all people! I feel great today. What did I eat in the last 24 hours? The answer was lots of healthy, wholesome foods. As a vegetarian I have to work at getting enough protein but spending a little time in the kitchen provides me with plenty of nutritious alternatives. If you’re dragging around, take stock of what you ate in the last 24 hours, it’s a little more work to prepare foods from scratch but fresh salads, whole grains, beans and legumes will provide better energy than fast foods, high fat microwavable dishes, etc. A cookbook for poor people, rich people, students, starving artists… all people. As a vegetarian if I don’t receive enough protein I will eat and eat and eat … and eat! Until my body receives the protein it needs, I’m hungry! Yet I cringe when I read about cancer being caused by a “protein” that runs amok. Eating too much protein can cause its problems and finding adequate protein without turning to animal sources is sometimes frustrating. But mixing the right amino acids together, which can mean beans and rice is crucial to satisfying hunger. It’s very tempting to simplify things and think that because one is obese they are well-fed. Protein is expensive and many who are struggling financially eat a lot of starches (macaroni and cheese boxes) to get by. Higher quality starches like whole grain brown rice and whole grain pastas and breads, though they are more expensive, are a better bargain in the long run because of the nutrition they provide. What’s This High School Skinny? I’m not so sure we’re supposed to be high school skinny. After all, take a look at the life of a tree. Don’t they get bigger as the years go by? If they are given room to grow, they spread out and become beautiful. Yes, studies say that thinner people live longer and there is no question that too much body fat causes problems, many of them fatal. So I strongly encourage myself to do my best to keep the fat down but I don’t expect to be high school skinny nor do I expect that of anyone else except those in high school and only if skinny is their body type. I will say that I wish I knew then what I do now in regards to calories and the way our bodies burn them. The metaphor of a wood stove helps me to understand the calorie burn. The bigger the logs the bigger the fire to burn them. No fire no burn. High school skinny? Not me. Comfortable with the body I have? Absolutely.